As many of you know, February 18 – 20 is/was Magic Market Week out in Las Vegas. If you are unfamiliar, MMW is the largest global market week for mens and womens contemporary apparel & footwear. MMW connects fashion buyers, stylist & trackers together with global brands. This is an expertly curated presentation that fuels what the world will be wearing in the seasons to come. From what I’ve been told, many great styles are on the horizon for those of us who get excited over things such as this. 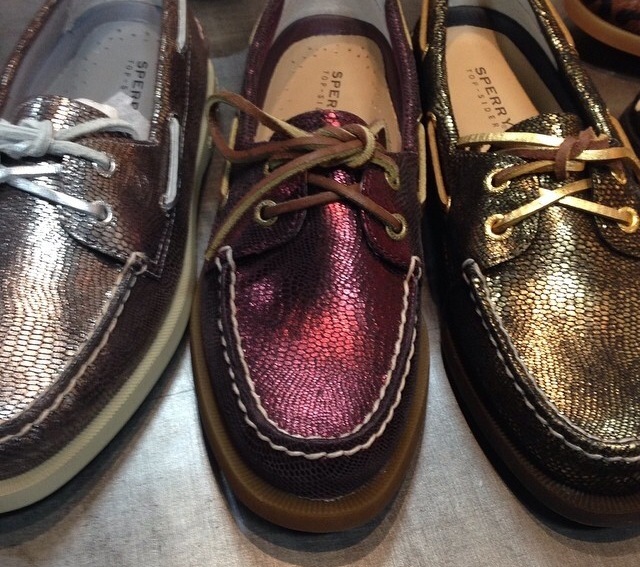 One item that has me salivating is the new glam Sperry. If you’re anything like me, you spent your spring/summer wearing Sperry’s & Jack Rogers DAILY. As a teen I wore the classic brown Top Siders. These days, there are many colors. Now Sperry has taken it up another notch by giving us this super glam, sock-it-to-me, reflective finish. I must get my hands on a pair as soon as they hit the shelves.